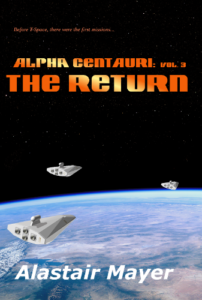 Alpha Centauri: The Return just launched on Amazon. This is the third of the Alpha Centauri series, and ties up the loose ends of the first two books–most of them, anyway. There is a price countdown (actually, count up, but that’s not what Amazon calls it) promotion on the first two volumes, First Landing and Sawyer’s World. The promotion starts Friday night at midnight Amazon time (Pacific time, so 1 AM Saturday Mountain, 3 AM Eastern) and runs until midnight (Pacific) the evening of August 2. Price will start at $0.99 and bump up at regular intervals until it’s back to the regular price. This is just for the e-book versions. Alpha Centauri: The Return will debut at $3.99 and then bump back up to the regular price of $4.99 next week. It’s available now. Update: The Eridani Convergence is late. Early feedback confirmed my gut feel that the plot threads were getting too complicated, so I’m revising. The plan is still to get it out before the holidays. The return to Alpha Centauri is coming. Or, rather, Alpha Centauri: The Return (book 3 of the series) should be available from your favorite Kindle store next week. Due to a few last-minute production issues, it won’t make the hoped-for July 20th (anniversary of the Apollo 11 Moon landing) release day. Sorry about that. Current target is now July 24th, which is the day the Apollo 11 crew returned to Earth. Maybe that’s a more appropriate anniversary anyway. To quickly recap, Alpha Centauri Book 1, First Landing details the first mission to Alpha Centauri (which I guess is somewhat obvious from the title, grin). At the end of that, the mission forks. One crew elects to stay behind to explore the second Earth-like planet, while the rest come back to Earth to report their findings. The time-lines for Books 2 and 3 are in parallel, with Sawyer’s World set in the Alpha Centauri system, and this latest, The Return, following as Drake’s crew returns to Earth, find some interesting things in the returned specimens, and work to get another mission back to Alpha Centauri to retrieve Sawyer’s crew. Oh, and remember the Chinese from Book 1? We find out more about that in The Return also. The trade paperback version of Alpha Centauri: The Return will be available a little later, but within a couple of weeks.